Will your hairdryer work in another country? What happens if you don't have the correct voltage? Do you need a Travel Adaptor? After experiencing some terrible hotel hair dryers (if they offer one), I finally looked into getting a travel hair dryer. Turns out there are some real winners out there. I’ve even started using my travel hair dryer at home, since it’s light and doesn’t strain my arms and shoulders. However, picking the right one is trickier than you’d think. Most of the world runs on 220/240 volts, while the U.S. runs on about half the voltage at 110/125 volts. You could bring a converter to enable your 110/125V device to work on 220/240V, but they are pricey and quite heavy. What happens if you don’t have the correct voltage? 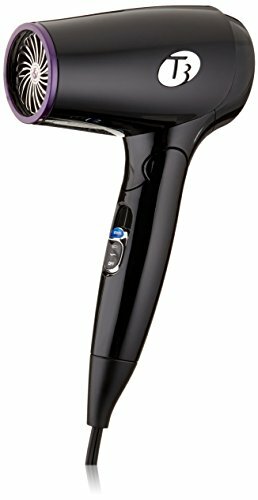 If frizz or heat damage is your concern, the Babyliss Pro Tourmaline travel hair dryer is great. By using negative ions, it keeps frizz at bay and dries hair quickly. Fold it down and it’s the size of a clutch purse, weighing only 10.5 oz. The hair dryer offers two drying settings, low and high, and has a good 1000 watts of power. I used the accompanying nozzle and my paddle brush to create a smooth, salon-worthy blow-dry. It also has a 5-foot cord, so I was able to stand a few feet away from the outlet without any trouble. If you are traveling abroad, it can easily be changed from 110V to 220V by turning the small screw into position, by using a small coin for example. It’s definitely one you will enjoy using at home or when you travel. If you want the performance of a high-end hair dryer in a small package, look no further. The T3 Micro Featherweight travel hair dryer is all the things you’d expect from a salon hair dryer, but in a travel-friendly size. At 12.8oz, it feels very light and I didn’t get tired of holding it like I do with my regular hair dryer. The hairdryer is surprisingly “whisper quiet,” despite being 1200W, and dries the hair quickly. I could still hear my TV without any trouble. Whether you choose the cool or hot setting, the dryer generates a high volume of air at a gentle speed. It magically dries hair quicker than most full-sized dryers I’ve used. 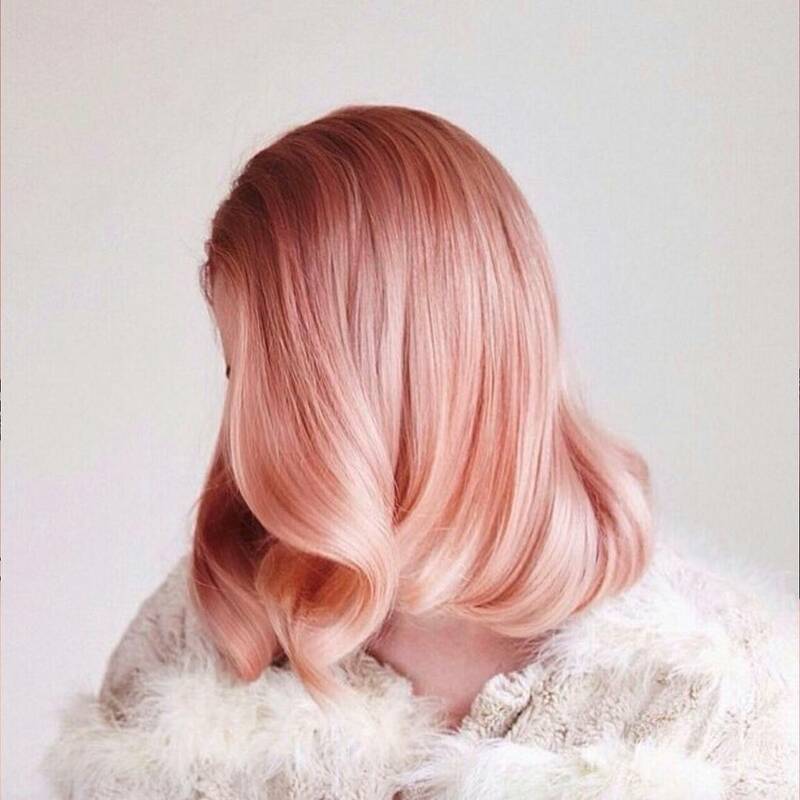 To create styles that last and hold, press the cool shot button after drying your hair. Included with the hair dryer is a concentrator nozzle, which makes it easy to create smooth styles. If you can’t find an outlet easily within reach, the generous 9-foot cord comes to the rescue. Once you’re done using it, it folds neatly away into its accompanying tote. To add some peace of mind, the manufacturer backs up their product with a 2-Year Warranty. 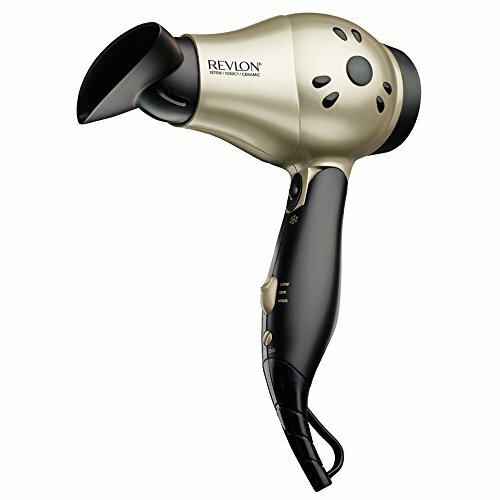 Great for the budget traveler, the Revlon Compact Travel Hair dryer offers practicality at an affordable price. If you don’t travel often or want something practical, this is a good option. At 1875W, it’s one of the most powerful hair dryers out there. Featuring ionic technology, it reduces hair frizz and protects hair from too much damage caused by blow drying. The two heat settings allow you to dry your hair gently or with more heat. It also features a cooling button to lock in hair styles after a hot blow dry. It comes with a concentrator nozzle attachment to help create smoother hair. It’s one the lightest hair dryers I’ve used, but is also a little bigger than others. It’s all about deciding what your needs are and what you’re willing to compromise. At this price, it’s a very good option. 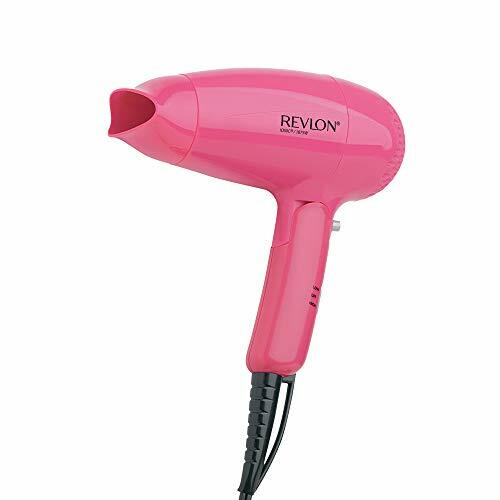 Pretty in pink, the Revlon Ionic Travel Hair Dryer brightens up any suitcase on a budget. At 14.4 oz, it’s noticeably bigger and louder than other hair dryers but explains the low price point. It is also a little bit bulkier than I’d like. You could definitely use this as your regular hair dryer at home or at the gym, where the weight matters less. Like most hair dryers, it has a low and hot setting, but also a cool shot button for setting hairstyles. The nozzle attachment directs air well for directional blow drying. Despite its weight, I found myself overlooking it because of its solid performance, nozzle attachment, folding handle, and dual voltage. Long-life powerful 1875w lightweight DC motor and negative ion emitter make it possible to home use,not only dry hair faster but make hair healthier and less frizz. Dual voltage(120~250V,50/60HZ)design,for worldwide use,it's also a good partner for traveling. Medium size and folding handle is portable to put away,hanging ring is easy to storage. 2 speed setting and cool shot button give you multiple options in different season no matter when at home or in travel. The Berta travel hair dryer ticks all the boxes on a budget. Despite being 1875W, you wouldn’t know it despite its high power capability. You can toggle between either the low and high setting and cool down your hairstyles easily with the separate cooling button. It features ceramic tourmaline technology, which emits negative ions that keep hair shiny, healthy and frizz-free. The hairdryer comes with a concentrator nozzle and bag for easy storage. The cord is a good 6-foot length, so offers ease and comfort when using. It’s good to know that if anything happens to break down, you get a 1-year replacement or 2-year warranty. Usually, hairdryers are little workhorses that last ages, but it’s a good thing to have just in case. The Conair Vagabond travel hair dryer offers simplicity and functionality in a distinctive teal color. Although it doesn’t offer ionic or tourmaline technology, it dries the hair well. A 1875W, this hair dryer is as powerful as larger hair dryers. The foldable handle allows the hair dryer to minimize its size and take less space if necessary. With a flick of the switch, it’s easy to slide up or down to the low or high settings. For a basic little hair dryer, it also comes with a cool shot button, which I like to use when setting my hairstyle. Occasionally I can’t find a conveniently placed outlet to plug into, but it’s no problem with the 5.5-foot cord. 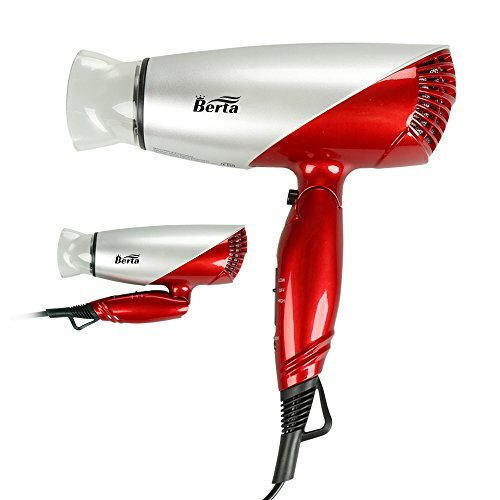 Even though this is a basic hair dryer, you can use it in a foreign country by using the dual-voltage function. By the way, it’s a good idea to set the destination’s voltage before your trip, than to fiddle with it once you are already on vacation. 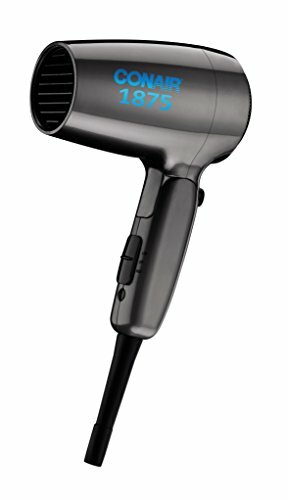 Although I found this hair dryer a little heavy at 1.3lbs, sometimes all you need is a practical hair dryer that works. At the low price point, it’s great value for money. Now that you’ve got the voltage addressed, make sure you also get a plug adaptor. American plugs are a different shape to other countries, so you won’t be able to plug in your device directly into a foreign outlet without a plug adaptor. It’s like trying to put a square peg into a round hole. Dual USB ports. Ideal for iPhone, iPad, Samsung Tab, iPod, Smartphones, 5V Tablets, Bluetooth Speakers & Headset etc. Rated power: 110V~/650W, 220V~/1300W. Power output: 100-240VAC~50-60HZ 6A Max. 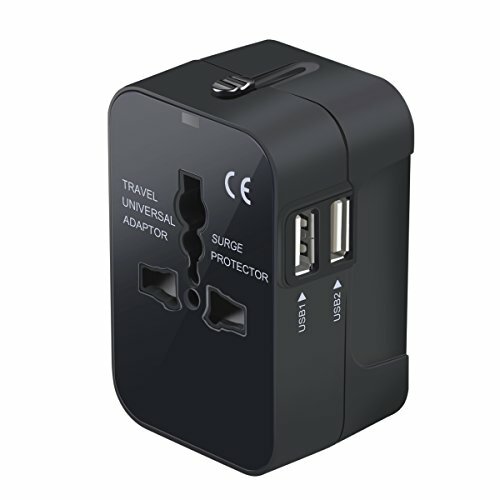 Only apply to the use of small power electric appliances when traveling, such as mobile phone, digital products, computer with low power of small household appliances.The travel adapter does not work with high power appliances such as hair straightener, flat iron, hair curler, hair dryer, steam iron, hot water heater, coffee maker, etc. It’s like the Swiss-army knife of adaptors and can be used in over 150 countries. With two USB ports on the side, it can be used simultaneously with the front outlet. I’ve plugged my laptop and cell phone into it (they’re both dual-voltage) while using my hair dryer simultaneously. When it comes to problem-solving technical things, I’m terrible. So this takes the guess work out of it. Highly recommended if you’re using American devices in foreign countries. Hope this helped. 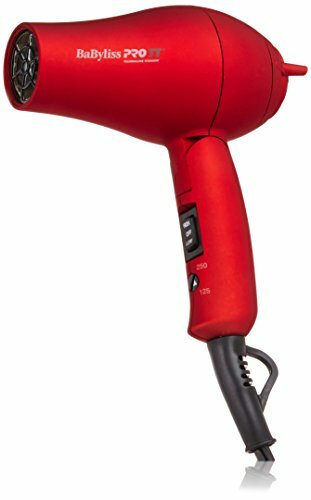 What’s your favorite compact hair dryer?